• Teen Advisory Committee: meets once a month and gives recommendations on materials to purchase, programs to offer, and suggestions for the Teen Section. All teens are welcome; to become a full member one must attend at least 3 meetings and turn in a book review to be published in the library newsletter. Snacks are always served. Please check the latest Teen program brochure for meeting times. • Weekly Volunteers: Teens volunteer to come in for an hour once a week. Duties may vary but generally include: shelving, making posters for upcoming events, photocopying, and helping set up/clean up for programs. Please pick up a volunteer application at the Circulation Desk, or download one from the link below. • Summer Reading Assistang: (entering grades 7-12) Summer hours as scheduled. Register participants for the Summer Reading program and explain details, award prizes and log information. Training provided, interviews in early May. Summer Reading Assistant applications are available at the Help Desk of the Library. • Library Shelver: The library is grateful to a group of individuals who come in on a regular weekly basis to reshelve returned books, magazines, and AV. 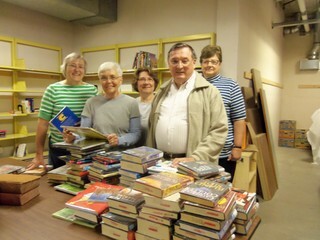 Volunteer shelvers help out at the same time each week for an hour or two; call Brendan Faherty at 827‐7404 or email him at faherty@midlibrary.org for more information. • Children’s Program Volunteer: Throughout the year ongoing programming and organizing of materials offer opportunities to assist the Children’s area. Tasks include shelving, craft preparation, program assistance, and shelf reading. In the summer there are additional opportunities to assist with the Summer Reading Program. For more information email Lori Bell at lori@midlibrary.org. • Middleton Public Library Board Member: The Middleton Public Library Board is appointed by the city’s mayor, but those interested in helping to formulate library policies and procedures can contact library director Jocelyne Sansing at 827‐7425 or the City of Middleton mayor at mayor@ci.middleton.wi.us for more information. Access the application to be a Library Board member from this link: Library_Board_Application.pdf Anyone with a general question about volunteering at the library is encouraged to contact Brendan Faherty at faherty@midlibrary.org / 827‐7404.